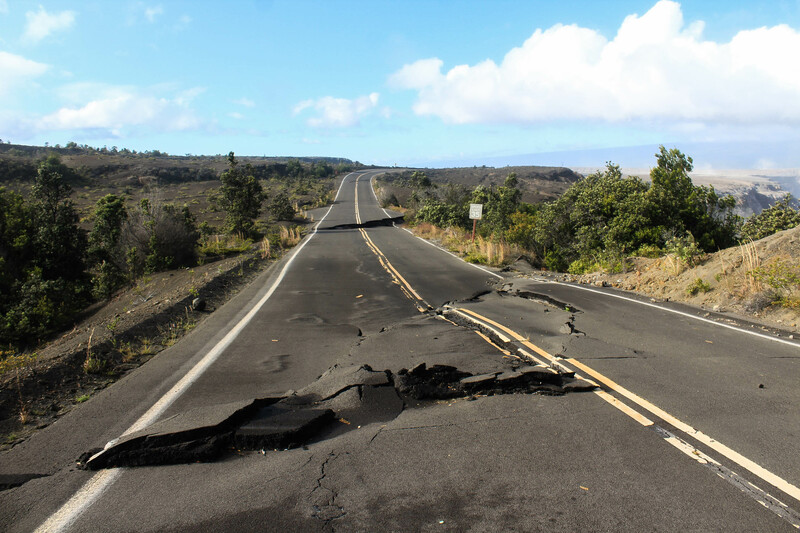 2018 was a very eventful year at Hawaii Volcanoes National Park, and in areas surrounding the park on the Big Island. Eruptions, earthquakes, a hurricane, and government shutdowns. A lot of things changed around this side of the island, and much of the park was closed for the majority of the year. We consider ourselves very fortunate to have been able to visit on the precise dates that we did. A month earlier we wouldn’t have been able to drive up to the Mauna Loa Trailhead, a few days later and we wouldn’t have been able to backpack, camp, or do all but one hike near the visitor’s center. 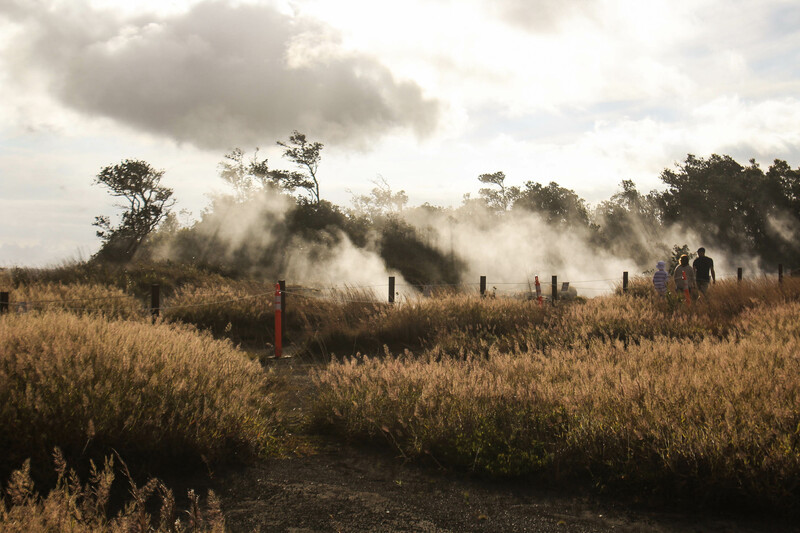 It’s hard to predict what will happen in the coming months and years, and how the park will continue to change — that’s just how it is when the main attraction is a very active volcano. That being said, if you are planning to visit it is always best to check the park website for the most recent alerts and conditions, because even though our visit was just a month ago as I’m writing this, things are different now than they were then. The main intention of this post is to record our experience here in December 2018, not to advise for future travel! 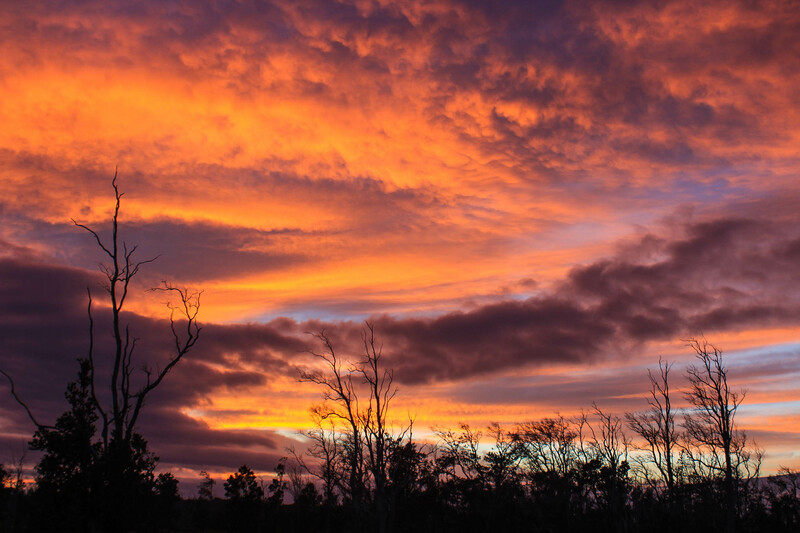 Since Mauna Loa is within the park’s backcountry boundaries, we spent the majority of our vacation here and camped every night at one of their designated campsites or cabins. Our trip was planned last minute, and staying here was the easiest and most cost-effective way to camp on the Big Island. Our first order of business after finishing Mauna Loa was to secure a campsite in the park’s only open drive-up campground. There are 9 spots in the Kulanaokuaiki campground, and they are first come-first served, $10 per night. We drove about 4 miles down the Chain of Craters Road to the road to the campsite, and then a few more miles down a one-lane paved road, altogether about 20 minutes away from the park entrance. The road used to lead to the Hilina Pali, with views out over the ocean, but the road was only open as far as the campground today. We arrived and claimed our spot for the next 2 nights. We really enjoyed staying here — it was so far from the visitor’s center and main attractions of the park so it was very quiet all night, just what we needed after 3 nights of sharing cabins and not getting a lot of sleep. 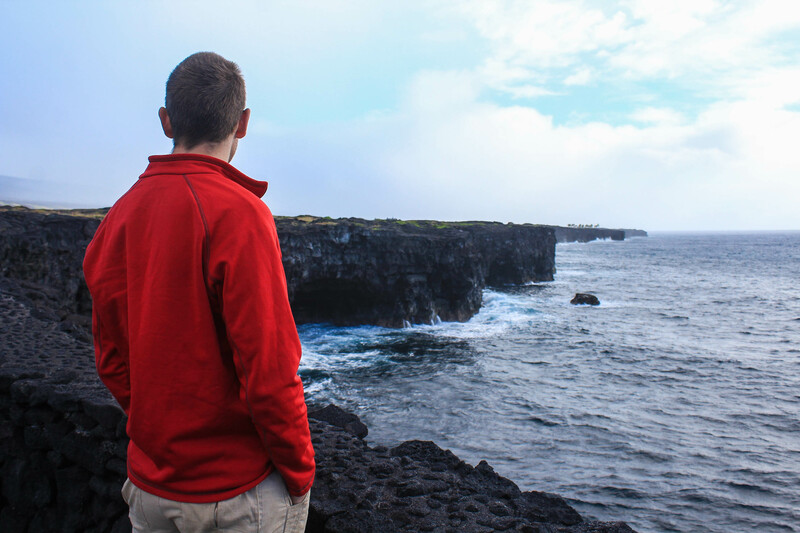 Since the elevation of this area is around 4000 feet above sea level, it was colder at night, but since we were now adjusted to the freezing temps of Mauna Loa, 50º didn’t bother us! After setting up our tent it was just after noon, and we needed to stock up on food for the remainder of our trip. We drove to Hilo, which is 30 minutes away from the park entrance, then we drove back and stopped at the visitor’s center to learn more about the park. One of the most interesting parts of the visitor’s center was the documentary film playing, sharing exactly what happened in 2018 that led to the eruption and earthquakes, as well as how much damage had been done and where. The before and after pictures of the volcano were truly impressive. To summarize, there used to be a lava lake at the bottom of the Kilauea as well as in nearby Pu’u O’o. Then late in April, the lake drained and the caldera floor collapsed. By mid-May, earthquakes had opened up fissures in the Eastern Riff Zone and lava began emitting and flowing to the sea. All of this activity is actually not in the National Park itself, but in residential areas to the East. 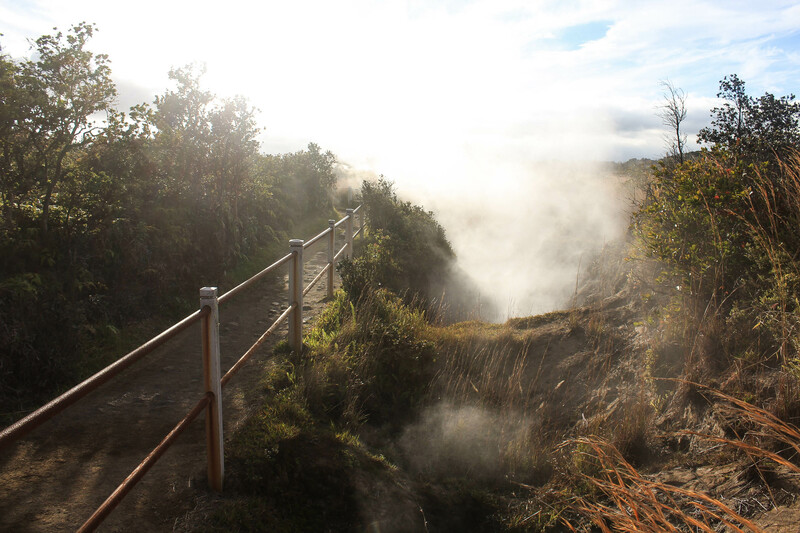 The Park was mostly effected by follow on Earthquakes caused by the caldera floor settling. Over the summer the caldera floor dropped over 50 feet and grew over 7 times in size. It is this that caused most of the infrastructure damage to the park. This timelapse shows how the area has changed. It was fascinating to us because while we were just 200 miles away, I don’t feel like I had a great idea of what was going on. And while there was currently nothing eventful happening, the film ended on a note of uncertainty, because no one really knows what could happen next. I knew before we arrived that there was no molten lava flowing, so I really wasn’t expecting much from our visit to the park. However, I learned that there is still some activity happening that’s interesting to see. Residual heat from the lava lake boils water deep in the earth and produces steam vents. Just down the road from the visitor’s center is a paved path that takes you right by many of these vents and to the Northern lookouts of Kilauea. While here, we also enjoyed walking through the small art museum. On our final day of vacation, the day after hiking Mauna Kea, we began by driving down to the end of the Chain of Craters Road. It was the beginning of a very rainy day on the Windward side of the island, but this turned out to be in our favor that morning. For the remainder of our time in the park, there was constantly a rainbow over us! We drove all the way down the road to the coast, stopping at a few lookouts and admiring all the different lava flow around us. It was especially interesting to see from the coast looking back up, seeing how it had dropped off the cliff. We had been hoping to hike through a lava tube, but unfortunately the one in the park was closed. For our last stop within the park, we decided to hike to the Keanakako’i Crater lookout. This used to be a spot you could drive up to, but the road was damaged in recent earthquakes so now in order to see it you must walk a mile on the paved road. It was raining lightly, but we put on our new windbreakers and they kept us (and my camera) warm and dry. While walking, we were able to see giant cracks across the road from the earthquake. 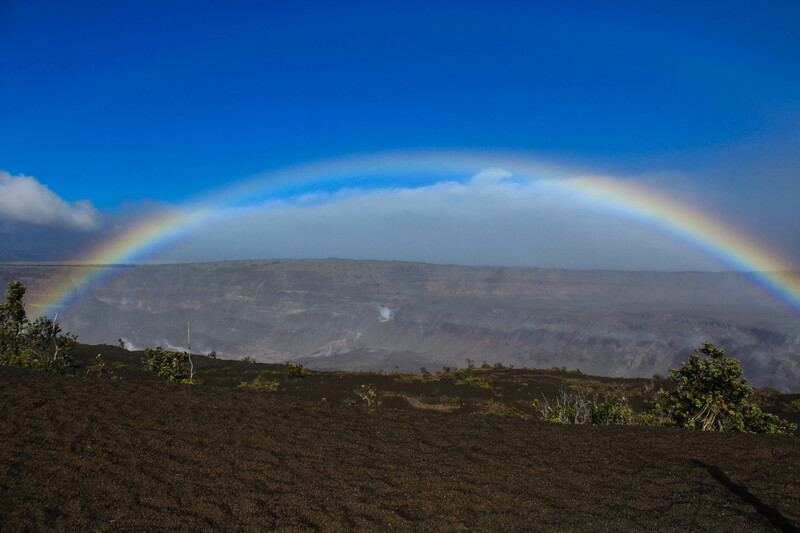 But the real reward for our effort was arriving to the lookout and seeing a giant double rainbow stretched out above the crater. It was an incredible sight; the juxtaposition of an object that has caused great destruction, along with a sign of God’s promise to us. I snapped pictures and wiped raindrops off my lens as quickly as I could, totally in awe and disbelief that we had actually come across this beauty. As soon as we made it back to our car, the rain began to pick up. We said goodbye to the national park and began our long road trip for the day. We occasionally post affiliate links to products we use. If you make a purchase through a link, we may receive compensation at no extra cost to you. We do not collect information from you as a reader. If you leave a comment or subscribe, we will have your email address. We will never sell or disclose your email to anyone else. © Saving Time in a Bottle 2019. All images and writing are my own unless otherwise noted.